The polyphagous shot hole borer, a brown-black beetle from southeast Asia, never gets bigger than a tenth of an inch. It breeds inside trees; pregnant females drill into trunks to create networks of tunnels where they lay their eggs. The beetles also carry a fungus called Fusarium; it infects the tunnels, and when the eggs hatch, the borer larvae eat the fungus. Unfortunately Fusarium also disrupts the trees’ ability to transport nutrients and water. Holes where the beetle bored into the tree get infected and form oily lesions. 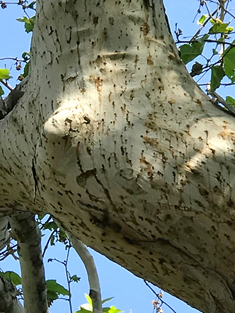 Sometimes sugars from the tree’s sap accumulate in a ring around the hole—that’s called a “sugar volcano.” The tree dies, and the wee baby beetles fly off to continue the circle of disgusting life. This would just be a scary story for arborists and tree-huggers, except: Fusarium dieback is on track to kill 26.8 million trees across Southern California in the next few years, almost 40 percent of the trees from Los Angeles to the Nevada border and south to Mexico. That’s more than just an aesthetic tragedy. It means that thousands of human beings are going to die, too. And at the base? Public health impacts—and differences in illness and death in populations that live near greenery versus those that don’t. It’s only been in the past few years that anyone has been willing to go out on a limb and associate morbidity and mortality numbers with nature. Oh, sure, everyone agrees that trees pull particulate-matter pollution out of city air. Simply by dint of being shady, trees reduce the “urban heat island” effect that drives people to run their AC all the time, a contributor to climate change. And, yes, trees inhale carbon dioxide, another win for the climate. That’s what McPherson is worried about, too. 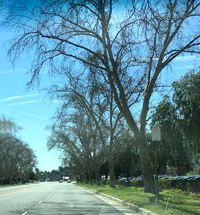 He was collecting data on California trees and Fusarium dieback for a journal article when he met John Kabashima, an entomologist working for the University of California on the Fusarium problem—an invasive pest that wasn’t jeopardizing crops but landscape. Kabashima realized that McPherson’s data might be what he needed to get some bureaucratic attention. What McPherson had come up with was, as he says, “the first statewide assessment for California, and probably the first nationally to combine satellite data and field plot data, and to incorporate the benefits and services of trees.” By his count, if the beetles spread as widely as he’s predicting, it could cost $1.4 billion in lost ecosystem service benefits—not counting the public health cost. The problem is, it takes a lot longer to grow experimental tree species and see if they’re up to spec than it does for drought, polyphagous shot borers, and fungus to do their work. The race is on—and not for all the usual reasons. “We don’t think of trees as something essential to our urban infrastructure, like roads or sewers. In fact, we see them as something that can interfere with those things,” Donovan says. “But health benefits are where it’s at. Trees are an essential part of our public health infrastructure.” If you believe that the ballpark value of a statistical human life, stated most coldly, is around $7 million, then the potential of tens of thousands of additional lives lost makes the cost of saving trees, and getting healthier ones planted, a bargain. 1 UPDATE 5/9/17 10:20 AM Corrected to more accurately reflect the progress of polyphagous shot hole borer infestation.